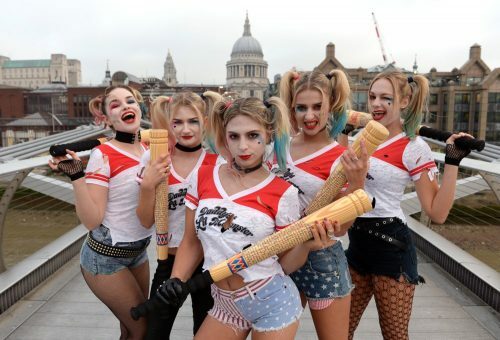 Five models dressed dressed in the style of Harley Quinn, played by Margot Robbie, from the movie ‘Suicide Squad ‘at Westminster Bridge to promote the extended cut release of the film on DVD, London. PRESS ASSOCIATION Photo. Kicking off the weekend’s Halloween festivities, a team of Harley Quinns took to the streets of London Thursday, to promote the forthcoming release of Suicide Squad Extended Cut out on digital download 28th November and 4K, Blu-rayTM 3D, Blu-rayTM on 5th December. Harley Quinn is set to be the No.1 Halloween costume of choice this year with Google Trends, earlier this week, reporting that it is the most searched for costume in the UK and US! The Suicide character, played by Margot Robbie in the film, has become a hugely popular look this Halloween as reports show that people are gearing more towards Superheroes as their costume of choice, rather than following tradition. Celebrities such as Poppy Delevingne, who previously dressed up as Harley Quinn, have already tapped into the trend and Holly Willoughby made a TV appearance on Celebrity Juice as Daddy’s Little Monster. So this Halloween let a bit of your crazy out puddin’!